Fertilizing with inorganic nitrogen and phosphorus definitely improves crop yields, but does it also improve the soil? The latest study to tackle this question has yielded mixed results. While 50 years of inorganic fertilization did increase soil organic carbon stocks in a long-term experiment in western Kansas, the practice seemingly failed to enhance soil aggregate stability—a key indicator of soil structural quality that helps dictate how water moves through soil and soil’s resistance to erosion. The results of the research, which was carried out in continuous corn that was also irrigated and conventionally tilled, were somewhat surprising to lead author Humberto Blanco, a University of Nebraska-Lincoln soil physicist. The findings appear in the May-June issue of the Journal of Environmental Quality. Fertilization typically leaves behind more crop residues in fields, he explains, which in turn can boost soil organic carbon levels. But unexpectedly in this case, “we didn’t see improvement in soil aggregate stability even though soil organic carbon concentration increased,” Blanco says, noting that soil particles usually bind together more strongly in aggregates as soil organic carbon concentrations rise. He cautions, however, that more research is needed over a wider range of management and climatic conditions, particularly since studies of fertilizers’ impacts on soil structural properties, such as aggregate stability, are currently few. In the present study, he and co-author Alan Schlegel studied a randomized and replicated experiment that was set up in 1961 at Kansas State University’s Southwest Research-Extension Center in Tribune. The experimental plots of irrigated and tilled (disk/chisel) continuous corn have received six different rates of ammonium nitrate fertilizer (range 0 to 200 pounds/acre) for 50 years. The plots also received two rates of triple superphosphate fertilizer (0 and 18 pounds/acre) for 50 years, and a higher phosphorus rate (36 lb/acre) for 19 years. Growing corn continuously under conventional tillage and with high inputs of water and fertilizer may seem outmoded, but this management system is “not uncommon,” as demand for corn grain and crop residues grow, Blanco says. When he tested soils from the experimental plots, he saw soil organic carbon concentrations rise gradually with increases in nitrogen fertilization at soil depths from 0 to 6 inches, although not at deeper ones. 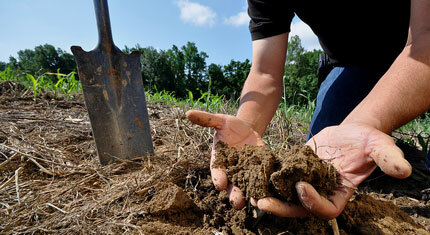 Similarly, phosphorus fertilization increased soil organic carbon at depths of 0 to 3 inches and 6 to 12 inches. But Blanco observed a different trend in soil aggregate stability, especially when nitrogen and phosphorus were applied together at high rates. At a depth of three to 12 inches, for example, adding more than 80 pounds of nitrogen per acre reduced the number of stable soil aggregates by 1.5 times when no phosphorus was applied, by 2.1 times at 18 pounds of phosphorus/acre, and by 2.5 times at 36 pounds of phosphorus/acre. Blanco can’t say for certain why this occurred, but he has some hypotheses. Some studies suggest that adding fertilizers rich in ammonium ions may cause soil particles to disperse rather than aggregate, thereby offsetting any positive effects of increased soil organic carbon content. Because tillage periodically disturbs the soil, it may also negate any benefits of fertilization. Blanco is now testing these hypotheses in three additional long-term experiments in Nebraska that encompass a wider range of tillage practices and cropping systems. The effects of nitrogen and phosphorus fertilizers on crop yields are well-researched, of course. Likewise, reduced tillage, cover crops, intensified cropping systems, and other conservation practices are known to build the soil long-term. Blanco now wants to see the two come together.